Psychedelic electronic music lost one of its leading lights on July 20, 2015, when pioneering kosmische musician Dieter Moebius succumbed to a longstanding battle with cancer, leaving behind a constellation of friends, family, and artistic collaborators to mourn his passing and reflect on his legacy. To commemorate his passing, the German label Grönland Records has released a comprehensive vinyl box set of one of Moebius’ most enduring projects — Harmonia — by compiling all of those releases into one insanely lavish package. Yet rather than serving as an obituary, the Harmonia box acts as astral portal, timeline, and time machine, transporting the listener to to the pastoral realm of Forst, Germany in the early ’70s, where Dieter Moebius, along with kindred kosmic spirit Hans-Joachim Roedelius and Neu! guitarist Michael Rother, would summon the future, while remaining rooted in antiquity. 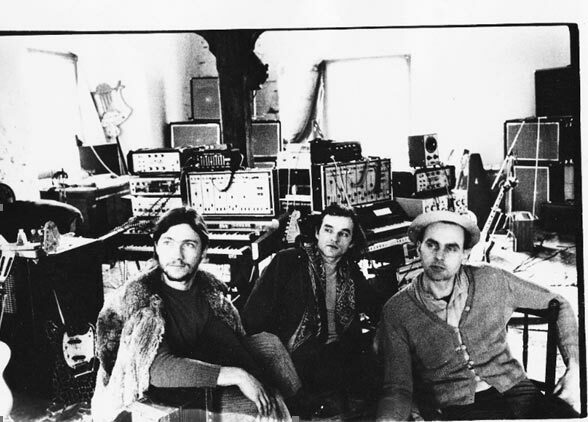 Moebius and Roedelius had already been working together in Cluster, after having met in Berlin in 1968. Due to the the political and socioeconomic climate, Berlin was its own musical island in the sea of Europe, making it hard for musicians to tour and travel. These conditions ultimately compelled Cluster to seek a more viable solution; on the recommendation of one of their friends, they relocated to Forst, a city on the German-Polish border. In this idyllic locale, some of electronic/psychedelic music’s most visionary music would be summoned, from the crumbling parlors of 500-year old farmhouses, as Harmonia was formed when Neu! guitarist Michael Rother came to visit Cluster. While Harmonia has always been well-received by the critics, in many regards, they are the ultimate indie band. 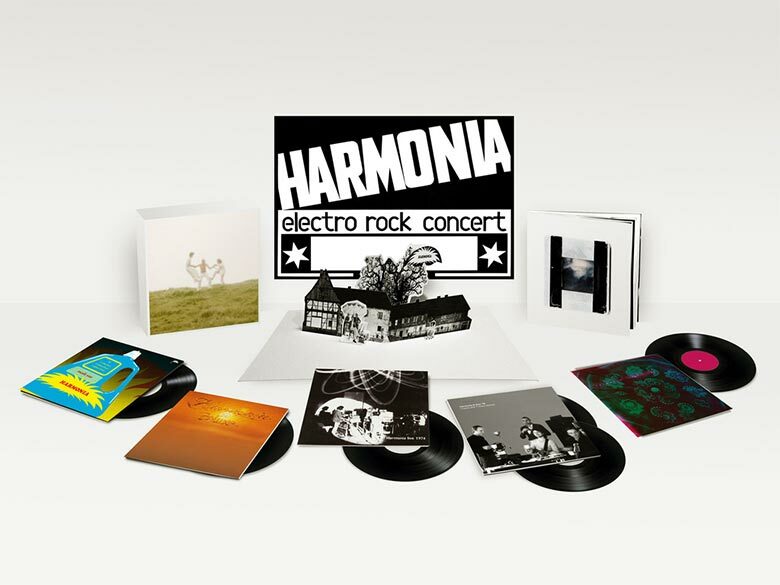 Despite regularly included in “Best of Krautrock” lists, and influencing subsequent generations of musicians, not that many people heard Harmonia’s influential first two albums, 1974’s Musik Von Harmonia and 1975’s Deluxe. Musik Von Harmonia and Deluxe could be seen as a pair of conjoined twins, showing the two faces of Harmonia. Taken together, they form an almost eerie precognition of the shapes, textures, and sounds of the next 4 decades. They drew the blueprints that subsequent musicians are now designing and decorating. Musik Von Harmonia is the “punkier” of the first two Harmonia records, in the sense that it is raw, immediate, and DIY. Aside from that, the record, with its languid lines of drifting synthesizers and hand-modulated machine rhythms, can be seen as a precursor to new age and techno music. Its songwriting process was also the most egalitarian of the Harmonia albums. Everyone did everything, with each member of the triptych taking turns playing guitars, keyboards, and electronic percussion. Cluster was already quite well-known and regarded when Michael Rother showed up at their doorstep, leaving the Neu! guitarist to play more of a backseat role in Musik Von Harmonia‘s genesis, although you can already hear glimpses of his almighty guitar tone, which would go on to influence so many. With the Cluster duo taking point, Musik Von Harmonia is a more immediate and improvised affair, showcasing Moebius and Roedelius’ reluctance to play the same music twice. Instead, lengthy jam sessions were laid to tape and later mined for gold. This loose, ramshackle, and intuitive method of making music would both attract and frustrate Michael Rother, who was used to the harsh strictures of his Neu! day job. 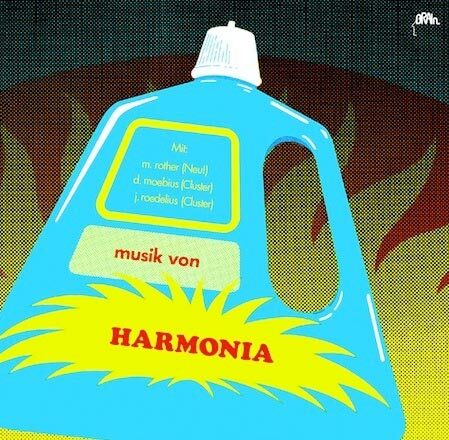 Despite being essentially a loose collection of jams, Musik Von Harmonia has some of Harmonia’s most memorable tracks, particularly album opener “Watussi”, with its meteor shower synths and repetitious drum machine grooves. The gorgeous “Sehr Kosmisch” also illustrates Harmonia’s playfulness, translating to “very cosmic” but being only one letter away from the German phrase for “very funny”. Here was a music that is playful, but also takes itself very seriously. It seems that Harmonia were heavenbent on opening a portal to some astral otherworld, from their living room to yours. Judging from the iconic pop art album cover, which was also designed by Dieter Moebius, it seesm they were convinced the world was ready for this music, needed it — though in a lengthy interview for Red Bull Music Academy a few years before his passing, Moebius talked about starting Harmonia as a way to “get rich”. That, sadly, didn’t happen, but adorning the experimental, uncompromising recordings of Musik Von Harmonia with bright pop-art-as-product album design showcases where Harmonia’s minds were at. It was as if they could see the emerging trends of discos, raves, home recording, and were trying to get ahead of the curve. Having gotten more comfortable with his position in the band and with his desire to realize his sonic vision, Michael Rother would step up to mastermind Harmonia’s second record, Deluxe. Rother loved the loose, organic method of creation, but wanted to find a way to balance freedom and organization. And while Deluxe almost sounds like a Fourth World Neu! record because of it, it is an essential aspect to what Harmonia were, and their enduring legacy. Deluxe is a prototype for the hyper-detailed technological art pop record, meticulously sculpted, textured, and layered. It is a striking statement, with its adventurous, optimistic melodies eked out of plastic synths, and, of course, beautifully showcases Rother’s glorious guitar playing. The synths themselves speak volumes of to duality of Musik Von Harmonia and Deluxe. Musik Von Harmonia was mostly constructed with archaic junkstore organs, which were processed through a battalion of guitar pedals. The music sounds like it could have come from 1666 or 2666. Deluxe, however, sounds almost digital, secured to a particular time and place. It could serve as the soundtrack to some sci-fi adventure movie, full of cities in the clouds and flying cars. It also finds Harmonia at their most rockist, with the wild-and-wooly guitar workouts of “Monza”, which was along the lines of what bands like Amon Düül II were doing around that time. One of the greatest gifts of having all of Harmonia’s music in one place and time is restoring the original timeline of the group. Harmonia initially disbanded in 1975, after Deluxe, succumbing to their creative differences. In 1976, however, one of Harmonia’s greatest advocates, Brian Eno, would pay a visit to Forst. 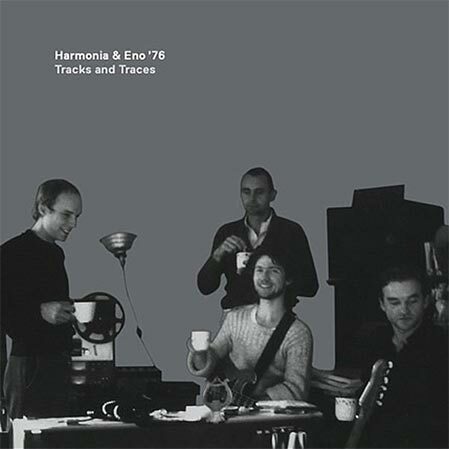 Eno called Harmonia “the world’s most important rock group”. Being a longstanding fan, Eno found an opportunity to visit in ’76, en route to work with David Bowie on his milestone Berlin Trilogy. Rather than sitting down to hash out a session, Eno found himself drawn into Harmonia’s rural rhythm of life, going for long walks in the primeval forests, helping to take care of the children, having long conversations about art and life. In the in-between moments, the music that would make up Tracks And Traces was recorded, using much better recording technology than the first two records.. Tracks And Traces, with credit to not Harmonia, but the project name Harmonia ’76, wouldn’t be released until 1997, but you can hear seismic echoes of the sessions throughout each of their subsequent solo careers. Tracks And Traces comes one year after Eno’s first foray into ambient music, with 1975’s Discreet Music, but two years before he would coin the term with 1978’s Ambient 1: Music For Airports. He was clearly seeking an eternal, transhuman music — a modern day Music Of The Spheres — that was also anticipating the rise of Muzak and the omnipresent soundtracking of our lives that we now know today. Tracks And Traces is a dazzling, dreamy instrumental rock/proto-techno record. Monolithic guitars carve across the sky like some millennial comet on “Welcome”, while “Vamos Companeros” is a hypnotic, grinding, pulsing motorik groove — essentially minimal techno, 20 years early. Despite being unreleased, “By The Riverside”‘s twittering field recordings and restrained spacious electric pianos would be the inspiration for Eno’s “By This River”, from 1977’s Before And After Science. It was through Eno that Harmonia’s ripples and rumbles would be felt. Although not specifically stated, Robert Fripp’s guitars on the early Eno solo records might as well have been sampled from a Harmonia record. And of course, Eno is well-known (and often criticized) for incorporating Klaus Dinger’s motorik groove into Bowie’s Heroes, introducing millions to the wonders of the German psychedelic underground. It would not be an overstatement to claim that the music scene we’re living in today would not exist without the works of Dieter Moebius, Hans-Joachim Roedelius, Michael Rother, Brian Eno, and too many more to mention. Their pastoral lo-fi recording setup in ancient farmhouse living rooms predicts the home-recording revolution that would begin in earnest in the late ’70s, creating the conditions for the postmodern meltdown of the indie revolution. Their music is perhaps most striking as a confluence, smack dab in the middle of the Ancient and the Modern. They’re a perfect hybrid of Neu! and Kraftwerk’s rigid, autonomic future pop and Faust and Amon Düül II’s more ritualistic take on kosmische. While being comprised of many threads and themes, Harmonia remain resolutely their own. Today, their music sounds unabashedly hopeful; like gliding into the future on a cushion of air. As we straggle our way into the 21st century, this is what we are still navigating: how to balance chaos and order, the handmade and the technological. At the turn of the century, it seemed that everyone was afraid of the future, choosing instead to lose themselves in pastoral fantasies, in the alternate dimensions of freak folk and throwback culture – the auditory equivalent of dropping out and joining a commune. But like it or not, this is the world we’re living in. We carry our technology with us wherever we go. At every moment, all of the world’s information surround our heads like a stormy halo, and we are left to deal with that fact. We’ve got all the loops, all the grooves, all the tools and templates and formats you could ever want to construct your masterpiece. Harmonia’s music seems timeless, endless. It’s like you come into it, as it’s happening, and it doesn’t end, you just walk away. These musicians seem to be perpetually gathered in some twilight clearing, jamming their way to infinity, opening the pathways to the stars. It sounds like the groove of the Earth, tearing its way around the sun — a musica universalis for the modern day.